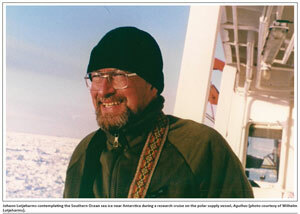 Johann Lutjeharms, who died aged 67 on 08 June 2011 in Stellenbosch, was a descriptive physical oceanographer who loved to go to sea in research vessels and to travel to far-flung destinations. His presence on seagoing research expeditions included many days in the Agulhas area, as well as trips to Marion Island and the Antarctic. He will be remembered by his many international collaborators for his tenacity in pursuing and studying various aspects of the greater Agulhas Current system, the culmination of which was his book The Agulhas Current, published in 2006. This book is destined to influence oceanographers for a long time to come. He was a pioneer of examining early satellite infrared derived sea surface temperature maps, and painstakingly deriving simple statistics of the positions of the ocean frontal systems around southern Africa. He is particularly well known for his term, 'the Natal pulse', which he used in 1988 to describe a large offshore meander in the Agulhas Current originating near Durban. This meander then travels slowly down the east coast of South Africa towards Port Elizabeth, where the current leaves the coast in a spectacular U-turn known as the retroflection. After this retroflection, the Agulhas Return Current makes a large excursion eastwards, before finally completing the loop back towards Madagascar after a period of 1-2 years. Lutjeharms obtained a BSc (Hons) degree in Physics, and the first Masters degree in Oceanography from the University of Cape Town (UCT). He then went abroad to the USA where he gained his PhD in 1977, with a thesis on the Southern Ocean mesoscale dynamics, from the University of Washington, under Professor Jim Baker's supervision. He returned to South Africa and took up a research position in 1978 in the newly established Council for Scientific and Industrial Research (CSIR) National Research Institute of Oceanology in Stellenbosch. There he commenced his in situ shipborne research measurements of the upper ocean, concentrating on areas in both the Indian and Southern Oceans. With the major cuts in South African public finances for science and the resultant commercialisation of the CSIR in the 1980s (which followed the example of Margaret Thatcher in the UK and the oceanographic institutes in New Zealand and other commonwealth countries), Lutjeharms was invited in 1990 by Professor Geoff Brundrit to join the Department of Oceanography at UCT as a professor and head of the Ocean Climatology Group. He held this position until his retirement in 2009. During his tenure at UCT, he earned his DSc in 1992 for his body of oceanographic research and was made a Life Fellow of the university. Lutjeharms held honorary doctorates from a number of South African universities. He served as a visiting academic at many universities around the world, thus building the international reputation of African marine science and oceanography. Amongst the many accolades he received was the Order of Mapungubwe (Silver), the country's highest national honour, presented to him by President Jacob Zuma in 2010 for his outstanding contributions to and achievements in oceanographic science. Lutjeharms was also a winner of the 2008 Individual 'Over a Lifetime Award' from the National Science and Technology Forum. In addition, he was one of only three UCT academics to have won all three of the university's academic accolades: the UCT Fellowship, the Distinguished Teacher Award and the Book Prize/Meritorious Publication Award. Lutjeharms was the most published author in the South African Journal of Science during its 107-year history, and revelled in supplying the journal with material for the cover page. His last paper in the journal will be published posthumously in a forthcoming issue. Lutjeharms started his interest in the global impacts of the Agulhas Current on the now well-known Meridional Overturning Circulation, often called the 'Great Conveyor' after its innovator Wally Broecker, helping to plan and execute (together with Arnold Gordon of Columbia University) the 1983 international multiship oceanographic cruise in the Agulhas Current Retroflection region south of Africa. This region is an important oceanic choke point between Africa and the Antarctic, where warm saline water in the upper 1000 m of the ocean leaks westward from the Indian Ocean past the southern tip of Africa into the Atlantic Ocean. From there, it travels slowly north across the equator to eventually join the Gulf Stream off the east coast of the USA. Lutjeharms and colleagues came up with estimates of this flow of 10 million tonnes/s -15 million tonnes/s travelling south past the Cape into the Atlantic Ocean. This estimate is still only about 10% of the volume flow of the greater Agulhas Current system, the majority of which 'retroflects' back eastwards into the Indian Ocean. The transport of water, heat and salt from the Indian Ocean into the South Atlantic Ocean has a direct bearing on the Earth's global heat balance. Lutjeharms is particularly remembered by his many graduate students, for his mentoring and support in furthering their careers. He also had a stubborn and uncompromising attitude to spending long periods of time writing and revising draft manuscripts for publication. He was a very dedicated publisher of his results, as illustrated by his prolific list of publications and international citations, and he was known to have said that he never had a submitted paper not eventually published! He enjoyed discussing oceanography and other scientific questions, and engaged in producing various publication statistics and strategies. Evidence of this is in the beginning of his book, which included an analysis of the number of publications per annum with the subject 'Agulhas Current' or a closely related topic. One such strategy he told me about, was to note the time of the year at which there was a low point in the submission of articles to Science, so that he could statistically improve his own chance of publication success in that journal! Professionally he produced 8 books, 32 contributions to books, 177 papers in peer-reviewed international journals, 117 reviews and popular articles, 46 research and technical reports and 14 contract reports. His articles in prestigious journals included two in Science and five in Nature. According to the Institute of Scientific Information, his papers have been cited more than 5400 times in the scientific literature to date. Lutjeharms enjoyed jogging, particularly around the Stellenbosch-Jonkershoek area, until the last decade of his life, during which he bravely battled a malignant tumour attached to the rear of his heart. This illness caused him to have to undergo very aggressive chemotherapy and radiation therapy beginning in 2003, which only slightly reduced the size of the tumour. After various periods of remission, he had to undergo further aggressive experimental treatment, which, he said, made him feel old and tired well before his time. He leaves his wife Ronel, who selflessly nursed him through the past decade, his daughter Maria and son Wilhelm. © 2011. The Authors. Licensee: AOSIS OpenJournals. This work is licensed under the Creative Commons Attribution License.